The goal of this research is to investigate and develop heuristic tools in order to extract meaningful knowledge from archeological large-scale data sets. Database queries help us to answer only simple questions. 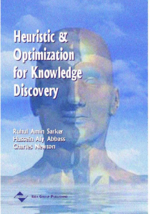 Intelligent search tools integrate heuristics with knowledge discovery tools and they use data to build models of the real world. We would like to investigate these tools and combine them within the genetic algorithm framework. Some methods, taken from the area of soft computing techniques, use rough sets for data reduction and the synthesis of decision algorithms. However, because the problems are NP-hard, using a heuristic approach by combining Boolean reasoning with genetic algorithms seems to be one of the best approaches in terms of efficiency and flexibility. We will test our tools on several large-scale archeological data sets generated from an intensive archaeological survey of the Valley of Oaxaca in Highland Mesoamerica.